Along with the stresses of life comes the difficulty to remain focused, keep calm and stay productive. The first step to tackle a problem like this is to understand the underlying problem. Whether it may be work-related issues, struggles in school or relationship difficulties, we all go through problems that make a huge impact on your lives. The trick is to be able to maintain a healthy and dynamic lifestyle despite any challenges we are going through. This may require a bit of meditation every morning or maybe an extra cup of that green tea latte to soothe your soul. While these great tricks could work for a day or two, some of us need a lending hand that will bring successful long-term results. This is where cognitive enhancing supplements come in – the bad boys that are designed to help you reach your fullest brain potential and maximize your cognitive functions such as focus and memory. SmartX is one out of thousands of these supplements available in the market today. The product became much in demand after getting positively reviewed on ABC’s Shark Tank. SmartX aims to increase the brain metabolism by providing needed vitamins, nutrients, and amino acids. Let’s see what this popular product is all about. 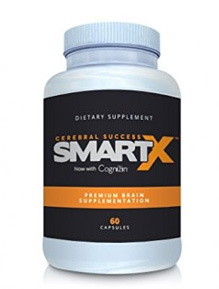 SmartX is manufactured by Cerebral Success ­– an American supplement company established in 2014. Despite its young age, the company has managed to do very well for itself particularly after receiving quite a huge chunk of money from the investors on Shark Tank. We also found out through research that the company is considering selling their product in GNC retail stores. This would be a huge step for SmartX as it would introduce the product to a wider audience of customers who are loyal to GNC and trust its products. A lot of great compounds immediately caught our attention. Vinpocetine works well to boost memory by increasing blood flow to the brain while Huperzine A can improve both long and short-term memory. Caffeine is a great substance to increase mental alertness and energy during work hours. Cognizin is also a great substance that improves neural communication and maintains nerve cell health. However, we must point out that this formula still has room for improvement. DMAE, for instance, is a substance that has recently been banned in the U.S., Canada and Australia as research has proven it to be fatal towards nerve cell health when used in the long term. Our team here at BrainEnhancementAdvisor.org decided to test the pills only for one week because of the overwhelming amount of customer reviews available online. With hundreds of different experiences shared on Amazon.com, we didn’t feel that it was necessary for two extra people to try the product for an entire month. Besides, it’s better to assess the results in general since each person may react to the product differently. Back to the trials! For the entire week, we did notice that an increase in focus was present. Our two testers could concentrate for 3-4 hours without feeling the need to take breaks or cool off. This was very impressive particularly because the results came within the second day. The product is available for purchase via their official website or Amazon.com. A 60-capsule bottle costs $65.99 and would last you an entire month. This price would be considered quite expensive in the world of nootropics, particularly because newer supplements are getting very competitive with their prices. SmartX is a good product that contains some very potent ingredients. Despite the minor red flag of containing DMAE, this product would be suitable for those of you who don’t mind being a little risky and consuming an FDA-banned substance. Results on Amazon.com and from our own testers tell us that the product does work to increase focus and concentration, especially when used for studying.